Early this year, I said yes when a friend asked me to join their UX side project team. It took us around six months to wrap up the whole thing — from the discovery phase to testing our prototype, so we named our team Unom, which means “six” in our native dialect. Why six months? All three of us were busy with our put-food-on-the-table jobs. Excuses, right? For this side project, my responsibilities revolved around user research, creating the testing plan, and taking care of the microcopy. If you’re curious ( I know you are!) how it went, take a ten-minute break and give the case study a quick read: A UX Case Study: Rose Pharmacy Customer Queue Management System. Yesterday, a friend asked me about UX and why do I care so much about it. As I’ve described before in a contest entry about valuable design outcomes, I would like to believe that advocating for UX is an exercise of pragmatic idealism. In recent years, I realized that I can’t be one of those people who can “change the world” by being an outspoken activist or by building a non-profit organization to promote a certain cause. We seek solutions to the world’s biggest problems, you see, only to find out that they’re merely band-aids. After taking stock of what I can and can’t do, it dawned on me that in order for me to help change the world (so idealistic, yes?) using my strengths, I would have to be more realistic. Employing pragmatic tools and methodologies is a good start. This is where advocating for user-centered technology comes in. Technology doesn’t have to make us “less human”. The supposedly cold, soulless AIs and bots are already here, but I’m still hopeful that we can create technologies that will not take “humanity” out of us. There’s a lot of talk about the impending man vs. machine doom, but what if we aim for man and machine working together? The more we advocate for user-centered tech through user research, the more it will help us understand each other. Understanding begets empathy. Empathy begets kindness. When you put technology out there with empathy as one of its cornerstones, the chances are high that people will treat their fellow humans the same way. For instance, when you’re effortlessly booking a ride home from a tired day at work via a ride-hailing app, you’re less likely to get grumpy by the time you get home. This might mean that you’re less likely to snap back at your partner who didn’t even bother to cook dinner. In short, you’re going to be more patient and kinder. Imagine if you were having issues using the ride hailing app. You’re probably going to project your anger and frustration to your clueless partner. And the cycle of hatred and indifference begins. It sounds tad simplistic but I’m banking for now on the school of thought that before we seek solutions to the world’s biggest problems like terrorism, world hunger, corruption etc, why don’t we start with the idea of treating each other with compassion, kindness, and openness? Technology is a pragmatic tool that can help us accomplish this idealistic goal, don’t you think? There are a lot of assumptions about True Love. Does True Love exist? Is it even possible? This design research aims to find out which assumptions are right or wrong, demystify True Love, and eventually build a prototype based on user needs. We are going to use Gooogle Ventures’ Design Sprint methodology. People you don’t know (to avoid bias and encourage objectivity) who will go through the design sprint with you. They can also act as moderators and observers on testing day. Reflect on what true love means to you. What does success in finding true love looks like? How will it be measured? Identify potential candidates that signify true love to you. Perhaps, we’re thinking about objects, pets, or even actions here. Who says true love= people? At this point, the single most important question to reflect on is: What Does True Love Look Like to Me? Explore possible answers to What Does True Love Look Like to Me? Create mind maps. Make a storyboard. Don’t limit your ideas for now. Identify potential pitfalls/conflicts in your proposed solutions. Too introverted? Too loud? Too smart? Too perfect? Too stoic? Too idealistic? Eliminate solutions that sound good in paper but not really doable in real life. Narrow down your list of candidates/solutions to MVP (minimum viable product). Vote with team members and choose one solution for prototyping. Build your low-fi prototype. You can use Keynote instead of code. What’s more important for now is you write real content instead of placeholder text. This will help you communicate better with your research participants using your task scenarios. Next, create your usability test plan. Pay special attention to your test script. Finally, take note that a good usability test plan should outline who takes care of what on testing day. Day 5 is your BIG DAY! You’re finally going out there, test your true love prototype with yourself and your participants, and identify what works/what doesn’t. Apart from paying attention to your participants’ answers, observe for non-verbal cues. Encourage them to think out loud too. This applies to you as well when it’s your turn to test the prototype. After testing, say thanks to your participants. You can also give them tokens of appreciation or incentives. Debrief with your team at the end of the day. Depending on the results of your test, you can either continue building your True Love product based on the responses you’ve collected or pursue further testing. So this is the part where I go from being a passive observer on LinkedIn to a semi ballistic panda because “oh shoot, someone is selling some career snake oil on the platform again and I have to do something about it”. I’m not against using these “persuasion principles”. In fact, it’s part of what I do as a copywriter where I persuade people via the written word. 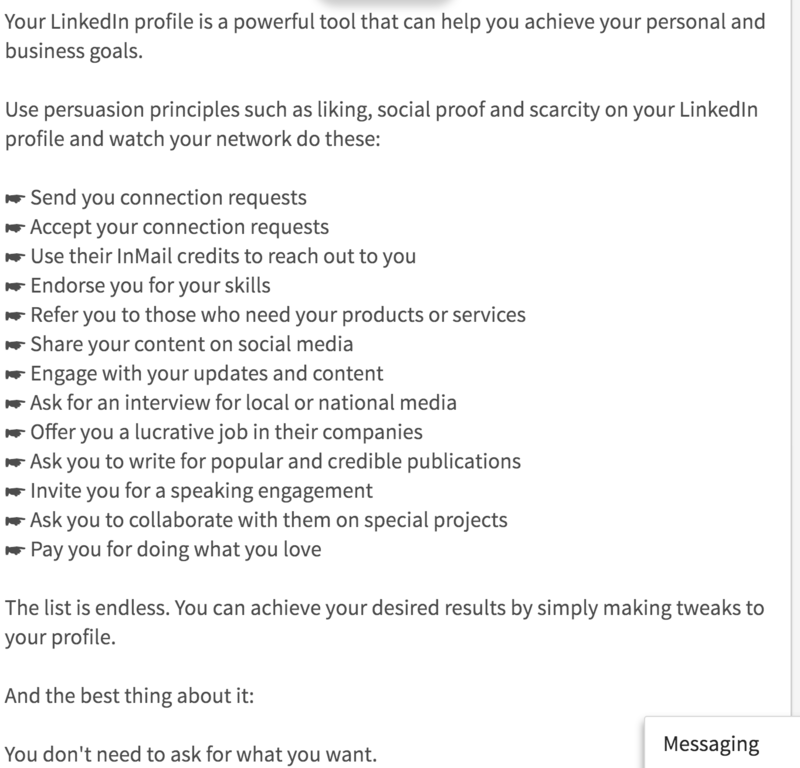 Sure, you’ll “achieve your desired results” from your network by liking their posts or endorsing them for skills (which, by the way, you know nothing about because you haven’t really worked with them in the first place). It’s a simple formula: I give you X so I expect you to give me X in return. However, citing these so-called principles are giving readers the wrong impression. I’m fairly sure that the relationships you build from these so-called strategies won’t have solid pillars to stand on. Before you spend countless hours doing all of these persuasion tactics, have you thought about the specific set of solutions that you bring to the table? What SPECIFIC VALUE do you offer? The problem with most of us (I am no exception!) is we expect results right away. As a result, we tend to forget the most important thing when it comes to building work relationships: helping a brand or business solve their problem. You can’t help these folks fix their business woes without knowing how your skills will fit into the equation. The first step is knowing whether or not you’re the right person who can help. So you do digital marketing? Or graphic design? Perhaps you’re a UX unicorn. Or you’re probably a senior web developer with a decade’s worth of experience. But all of these are not solutions, they are merely broad skills and experiences. Instead, identify which skills of yours can help solve a business or brand’s problem. Missing this first step explains why a lot of people are disheartened about LinkedIn, lamenting how the networking platform is not working for them. You can’t effectively sell your services and skills to recruiters and clients when you don’t even know your Unique Value Proposition. Take a moment to reflect on the specific skillset that you bring to the table. If you think you’re lacking one, learn something new. Once you’re sure about the value you offer, use those persuasion tactics by all means!